*Can be read as a standalone* "Between a hot fireman and a sweet librarian, I never wanted the story to end. Each page sizzled with a slow burn, and it was a fantastic and heartwarming story." 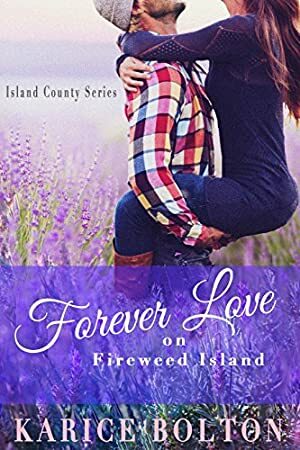 Jewels Jennings -- zippy librarian by day and book blogger by night -- came back to the one and only place beyond the pages of a book that has given her happiness, Fireweed Island. Years ago, she tore off the island in a speedboat with the man she was supposed to marry in tow and a vow never to return to small-town living... only to return with her tail between her legs, newly divorced, and completely skeptical of anything resembling love. She prefers to stick to the men between the pages of her latest read rather than waste time in the real world. Jake Harlen fled to Fireweed Island with the hopes of forgetting his past. He's been busy carving out a life that anchors him far away from people and the complications they always manage to deliver. He likes his life, manages it with the care it deserves, and is content in his single ways... until he goes on a rescue call and meets the town librarian. When Jewels finds her life hanging in the balance more than once, Jake is the only one who can save her, but neither of them realizes the magic of love that Fireweed is determined to deliver, but only one of them is ready to accept what fate has in store. We started tracking this book on May 29, 2016. The price of this book has changed 4 times in the past 1,056 days. The current price of this book is $2.99 last checked 20 hours ago. The lowest price to date was $0.99 last reached on November 27, 2016. The highest price to date was $3.99 last reached on December 30, 2017. We last verified the price of this book about 20 hours ago. At that time, the price was $2.99. This price is subject to change. The price displayed on the Amazon.com website at the time of purchase is the price you will pay for this book. Please confirm the price before making any purchases.